Dogs shows are a big part of the everyday life here at Rhapsody! bottom of the page in the order that they completed their champion title. This page was last updated on 12/16/04!! 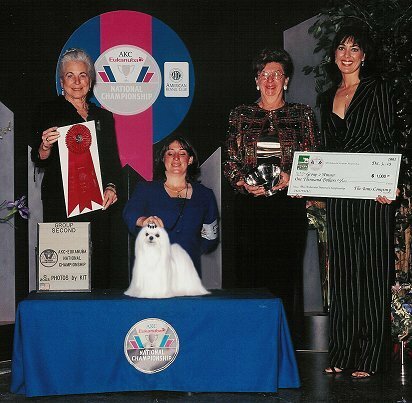 Thriller is shown here winning a Toy Group 2nd under judge Elaine Young with owner/handler Tonia Holibaugh at the Prestigious AKC Invitational in Long Beach, CA December 4th, 2003 against the top toy dogs in the country. 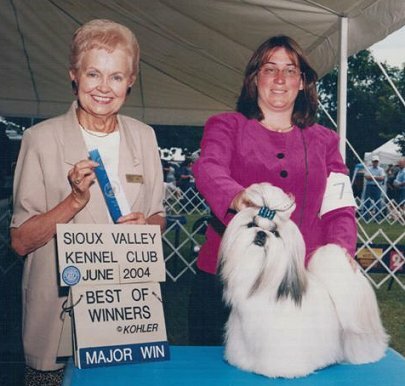 Thriller is a Multiple All-Breed Best in Show Winner in both the US and in Canada as well as a Multiple Best in Toy Show Winner. 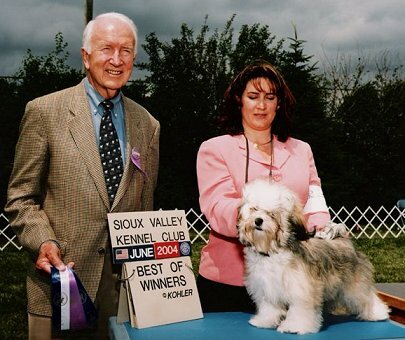 He was undefeated in Breed competition for 2003 and won Best of Breed at both Progressive Toy Dog Club and Westminster Kennel Club in Feb 2003. He is co-owned by Barbara Davis of Veranda Maltese and Tonia Holibaugh of Rhapsody and is being sponsored by Arlene Muzquiz and PurePaws.net. 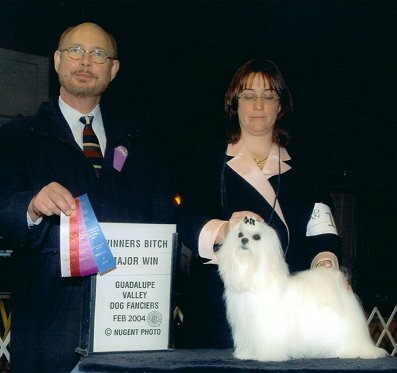 His breeder is Joyce Watkins of the infamous Marcris (Reg) Maltese. Thriller is currently ranked the #1 Maltese All Systems and #5 Toy in the US for 2004. 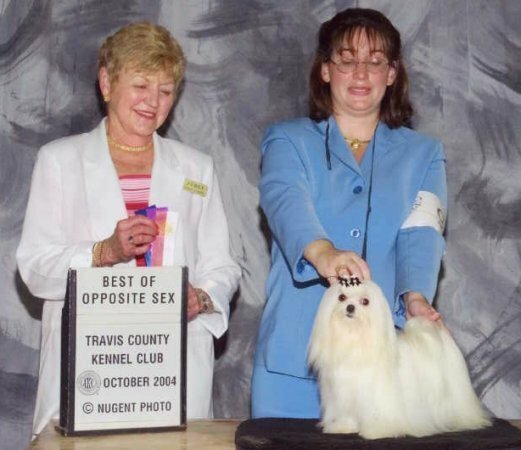 He was the #1 Maltese and #9 Toy for 2003. 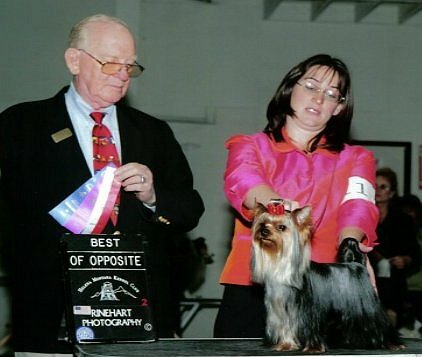 He has won 14 All-Breed Best in Shows in the US! He is also ROM* eligible for siring 14 champions to date. Look for his many wins through out this website and look for him in the ring as a special as well as his kids in the ring too!!! 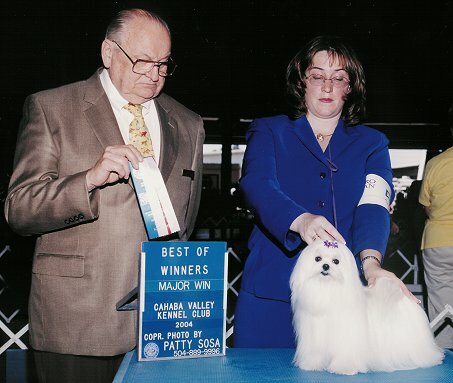 Danger, shown here winning a Toy Group Fourth in Canada, is a Thriller son. He is co-owned by Charlotte & Steve Ampelas, Tonia Holibaugh and his breeder Angie Stanberry. He was shown in the US by Tonia and in Canada by Jennifer Shaw & Ron Stonke. Look for Danger in the future at Specialities ... we are THRILLED to see how he matures. Sake finished his champion title quickly. He is owned by Charlotte Ampelas and Arlene Muzquiz, he was bred by Barbara Cantlon. 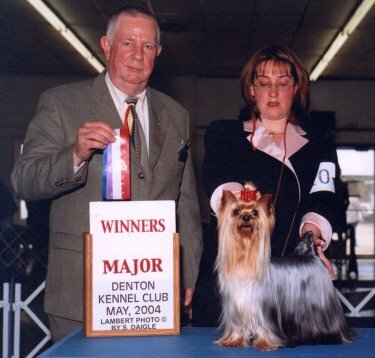 Maggie is shown here winning one of her 4 majors wins under judge Peggy Hogg. She is owned by Carl and Debbie Sheppard and bred by Angela and Larry Stanberry. 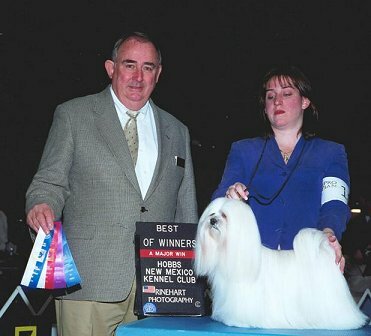 Seeker is shown here winning a major and completing his champion title under Judge Mrs Lydia Hutchinson at just 11 months of age. 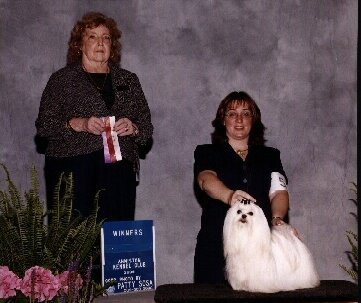 He is owned by Mrs Yoko Matsumoto and his breeder Tonia Holibaugh. Dare is pictured here winning under judge Dr R Smith. 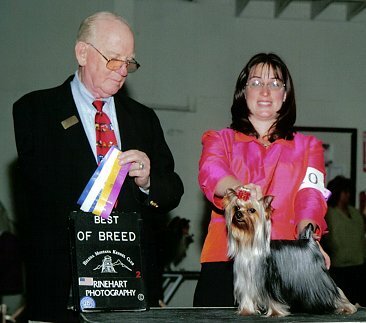 She is owned and bred by Sharon Gillette. Katie completed her title winning a major under judge Mrs Sari Teijen. She is Sired by our BIS Bandit, owned by Arlene Muzquiz and Tonia Holibaugh, her breeder/handler. 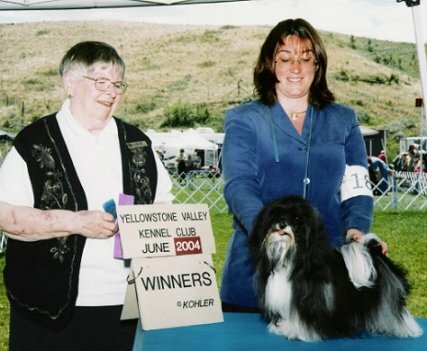 Bailey is shown here finishing her title under judge Mrs Joan Scott. She is owned by Valerie Gerace and bred y Miss Florence. 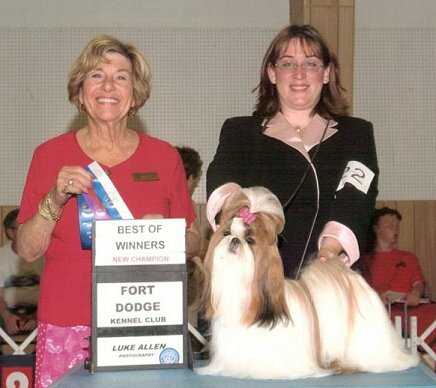 Pebbles is shown here winning under Judge. She is owned and bred by Susan Wood. 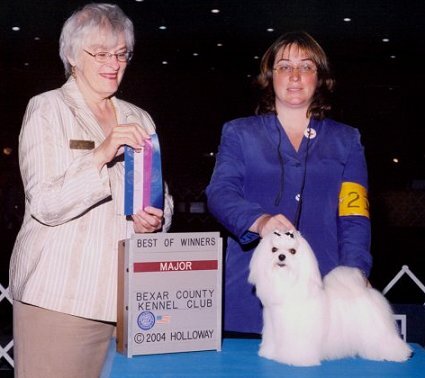 Gabe is shown here winning a major under judge Helen Lee James. He is owned and bred by Angela and Larry Stanberry. 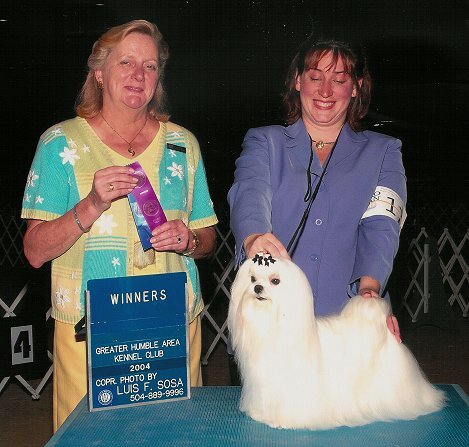 Tia is shown here finishing her title under Judge Ms Margaret Reed. She is owned and bred by Tracy Halverson Burdick. 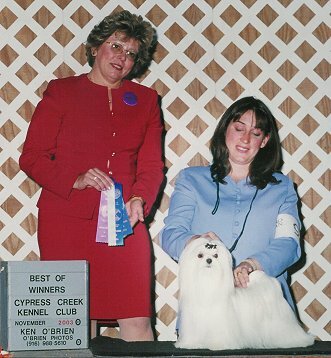 Cole is shown here winning a major under Judge Mrs Charlotte McGowan. He is owned by Angela and Larry Stanberry and bred by Beth Lauer. Pandee is shown here winning under judge Mr Joe Tacker. He is owned and bred by Frank and Brenda Horn. Willie is shown here winning a 5pt major under judge Mrs Betty Duding. He is owned by Vernelle Arnold and bred by Mrs Randle. Harpo is shown here winning under judge Deloris Maltz. 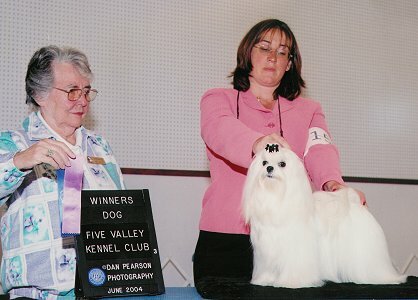 Marc is shown here winning under judge. He is owned by Angela & Larry Stanberry and bred by Sheila Riley and Angela Stanberry. Tiffany is shown here winning under judge Betsy Leedy. 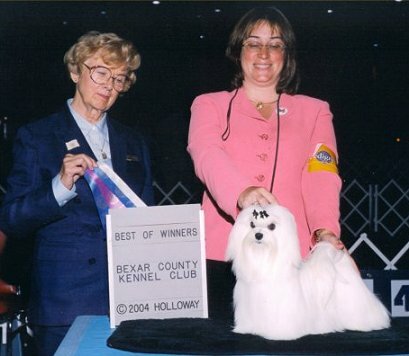 She is owned by her breeders, Frank and Brenda Horn - BF Havanese. 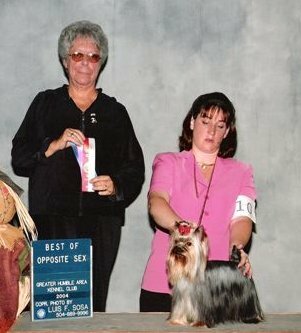 Betsy is shown here winning under judge. 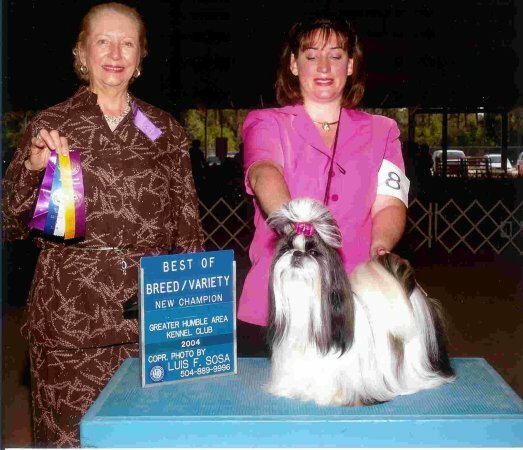 She is owned and bred by Sheila Riley. Holden is shown here winning under judge Dr R Smith. He is owned and bred by Sharon Gillette. Lola, shown here winning under judge Stephen Hubbell, is a Thriller daughter. She is co-owned by Brandy Hyman & Angela Stanberry and bred by Tonia Holibaugh. Naughty is shown here finishing her champion title. 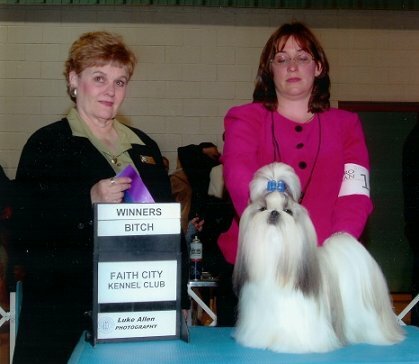 She is owned by Barbara Babcock and bred by GG Zybko. Ribbons is shown here completing her champion title with a major win under judge Mrs Elaine Rigden. She is owned and bred by Nancy Wills. 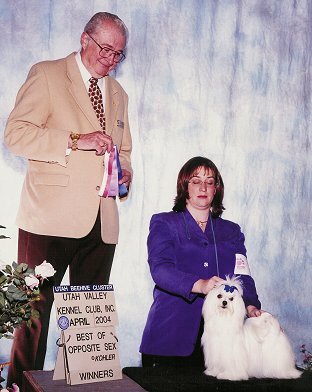 Dori is shown here winning a major under judge Dr Robert Berndt. She is owned/bred by Barbara Davis and her sire's, Bandit, 5th champion, which makes him eligible for his ROM title. Malachi is shown here finishing under judge Mr Jordan Chamberlain. He is owned by Sheila Riley and bred by Angela and Larry Stanberry. 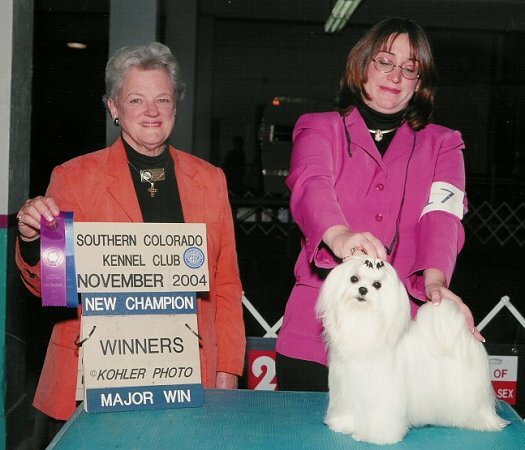 Portia is shown here winning under judge Mr Don Sutton. She is owned and bred by GG Zybko. Dancer is shown here winning a major under judge Elaine Mathis. She is owned/bred by Charlotte & Steve Ampelas. Megan is shown her winning under judge Mrs Suzanne Dillin. She is owned by Christopher Vicari and Manny Comitini and bred by Mrs Randle. 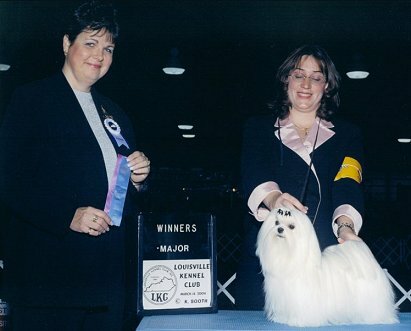 Lulu is shown winning a major under Judge Mrs Wendy Paquette. She is owned and bred by Angela and Larry Stanberry. Meg is shown above winning a major under judge Mr Joe Walton. She is owned and bred by Arlene and Peter Oley. 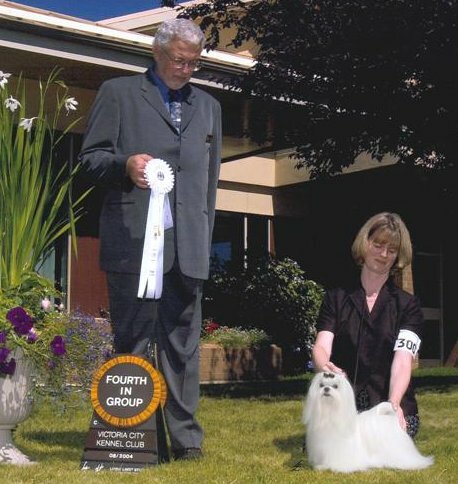 Pansy is shown winning a major her first weekend out under judge Mr Tim Robbins. Pansy is bred by Sheila Riley and owned by Angela and Larry Stanberry. Sundance, shown here winning a major under judge Janet Jacobsen, is a Bandit son. 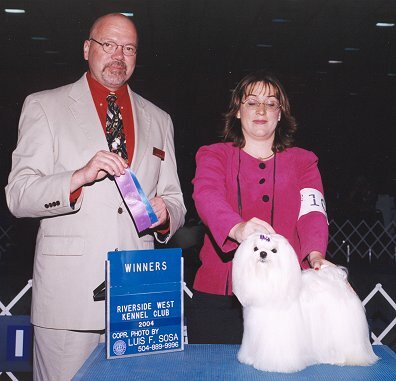 He is co-owned by Charlotte & Steve Ampelasa dn his breeder Tonia Holibaugh.